Assessments are a key component of the instructional process. A variety of assessment types work to help give educators valid and reliable indicators to provide a fair picture of the student’s learning. Student’s test scores have become the assessment tool for students as well as their teachers. With high stakes testing in abundance nation wide, professional educators must become informed about educational assessment because it is a key element in helping determine if a school is successful. Unfortunately, educators today complain that the amount of assessing required often overshadows the teaching process. Many districts are required to deliver product based assessments rather than allow the teacher created assessments aligned with the teacher’s created lessons. Finding a balance and integrating assessment into the instructional process will help teachers not feel overwhelmed. Assessment can be categorized into two types. Assessment FOR learning and OF learning. Much to the dismay of legislators across America “just because you teach something doesn’t mean they learn it.” We had become a nation of teachers teaching to the test and are morphing into a nation of educators teaching to the learning. We have made a shift on fundamental purpose from a focus on teaching to a focus on learning including a shift from a summative score to informative opportunities for intervention. Pre-assessments provide instructors with information about student’s prior knowledge and misconceptions before beginning a learning activity. They also provide a baseline for understanding how much learning has taken place after the learning activity is completed. Pre-assessments often focuses on one area or domain of knowledge. It can provide educators with information about each student’s prior knowledge before beginning instruction. You can use the pre-assessment to assist in developing lesson plans and providing differentiated instruction to meet children’s needs. Instructors usually build concepts sequentially throughout a course. The pre-assessment helps the teacher focus on particular areas to build the capacity for learning that specific domain. Formative Assessment occurs in the short term, as learners are in the process of making meaning of new content and of integrating it into what they already know. Feedback to the learner is immediate (or nearly so), to enable the learner to change his/her behavior and understandings right away. Formative Assessment also enables the teacher to “turn on a dime” and rethink instructional strategies, activities, and content based on student understanding and performance. His/her role here is comparable to that of a coach. Formative Assessment can be as informal as observing the learner’s work or as formal as a written test. Formative Assessment is the most powerful type of assessment for improving student understanding and performance. Research indicates formative assessment has a powerful impact on student learning. In addition, formative assessment is particularly effective for students who have not done well in school, narrowing the gap between low and high achievers while raising overall achievement. Most instructors intuitively use questioning as a method of formative assessment but in large lecture classes not every student can be questioned because of time constraints. Formative assessment is also useful in virtually all learning activities such as preparing oral and written reports, fieldwork and as projects and case studies progress. Examples: a very interactive class discussion; a warm-up, closure, or exit slip; a on-the-spot performance; a quiz. 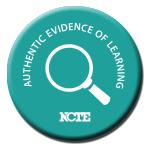 … self-assessment by pupils, far from being a luxury, is in fact an essential component of formative assessment. Teachers must give students tools to help build their capacity to accurately self assess. Reflective prompts to guide a depth of thinking are a specific tool, along with student-led conferences, goal setting, and time management. Benchmark or Interim Assessment takes place occasionally throughout a larger time period. Feedback to the learner is still quick, but may not be immediate. Interim Assessments tend to be more formal, using tools such as projects, written assignments, and tests. The learner should be given the opportunity to re-demonstrate his/her understanding once the feedback has been digested and acted upon. Interim Assessments can help teachers identify gaps in student understanding and instruction, and ideally teachers address these before moving on or by weaving remedies into upcoming instruction and activities. Examples: Chapter test; extended essay; a project scored with a rubric. Diagnostic Assessment is another name for progress monitoring. Teachers assess students to monitor the level of success of students and helps the teacher know which direction to go as the learner’s work is assessed. The student is unaware of the monitoring unlike a formative assessment which provides students immediate feedback. Think of a doctor being presented with symptoms and having to make a diagnosis in order to prescribe a treatment plan. A diagnostic assessment does much of the same. The teacher is presented evidence of learning and the teacher much make a diagnostic assessment on order to prescribe what next for the learner. Summative Assessment takes place at the end of a large chunk of learning, with the results being primarily for the teacher’s or school’s use. Results may take time to be returned to the student/parent, feedback to the student is usually very limited, and the student usually has no opportunity to be reassessed. Thus, Summative Assessment tends to have the least impact on improving an individual student’s understanding or performance. Students/parents can use the results of Summative Assessments to see where the student’s performance lies compared to either a standard (MEAP/MME) or to a group of students (usually a grade-level group, such as all 6th graders nationally, such as Iowa Tests or ACT). Teachers/schools can use these assessments to identify strengths and weaknesses of curriculum and instruction, with improvements affecting the next year’s/term’s students. The teacher clearly describes the lesson’s learning target.  The teacher effectively checks for understanding.  The teacher can precisely describe how well all students are learning.  Students can precisely describe how well they are learning. Examples: Standardized testing (MEAP, MME, ACT, WorkKeys, Terra Nova, etc. ); Final exams; Major cumulative projects, research projects, and performances. Black, P and Wiliam, D 1998, Inside the black box: Raising standards through classroom assessment. School of Education, King’s College, London, UK. Black, P, Harrison, C, Lee, C, Marshall, B and William, D 2003, Assessment for Learning – Putting it into practice OUP, Berkshire, England. Clarke, S 2005, Formative assessment in the secondary classroom, Hodder Murray, UK. Dann, R 2002, Promoting assessment as learning: Improving the learning process, Routledge Farmer, London. Earl, L.M 2003, Assessment as learning: Using classroom assessment to maximize student learning, Corwin Press, California. Knight, Jim 2011, “Unmistakable Impact.” Corwin Press, California. Popham, W. James 2010, Everything School Leaders Need to Know About Assessment. Corwin Press, California.